Height 1300 mm / 51.2 in. Acceleration 0 - 100 km/h / 62 mph 4.6 sec. US only model. 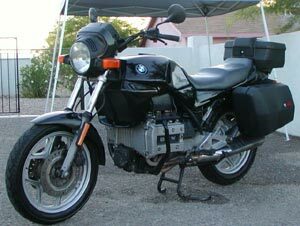 Its a standard K75C modified by BMW US as follows: It had the double-bucket touring seat used on the K100RT and LT bikes. 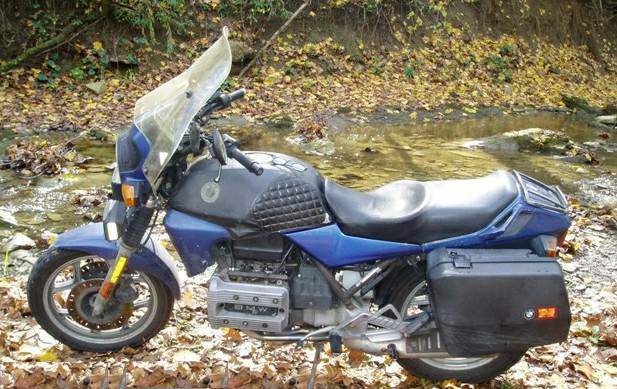 It was equipped with a headlight housing with integral turn signals identical to the 1988 low seat "standard" models and had the "international" windshield which was originally used on the K100 standard models in 1985 and 1986 in the U.S. The front suspension is almost exactly the same as on the R65 -- a hydraulic fork with a spring in each leg. The springs on this motorcycle are stiffer than the R65, which is pretty nice for regular riding, but could be improved for going over big bumps.